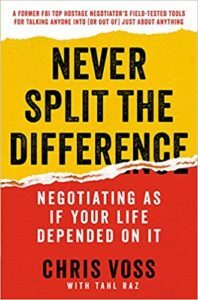 Negotiation serves two distinct, vital life functions: information gathering and behavior influencing. Negotiation is simply communication with results. Psychotherapy research shows that when individuals feel listened to, they tend to listen to themselves more carefully and to openly evaluate and clarify their own thoughts and feelings. LISTEN. In negotiation, each new psychological insight or additional piece of information revealed heralds a step forward and allows one to discard one hypothesis in favor for another. Really smart people find negotiation difficult because they feel like they have nothing to discover. Going to fast is one of the mistakes all negotiators are prone to making. If we’re too much in a hurry, people can feel like they’re not being heard. Passage of time is one of the most important tools for a negotiator. Direct/Assertive - rarely used, if at all. Signals dominance. Avoid this. Imitation. We copy each other to comfort each other. It can be done with speech patterns, body language, vocabulary, tempo, and tone of voice. We fear what’s different and are drawn to what’s similar. Action: Mirror the last 3 words someone says. Labeling is a way of validating someone’s emotion by acknowledging it. Instead of denying or ignoring emotions, good negotiators identify and influence them. Emotion is a tool. Tactical empathy: understanding the feelings and mindset of another in the moment and also haering what is behind those feelings so you increase your influence in all the moments that follow. Action: Spot their feelings, turn it into words. Respectfully repeat their emotions back to them. First - Spot the emotion. Second - Label it aloud. Third - Silence. Be quiet and listen. For good negotiators, receiving a “No” is better than getting to “Yes”. “No” is an opportunity to clarify what you really want by eliminating what you don’t want. “No” is the start of a negotiation, not the end of it. When someone refuses your proposal, ask them, “What about this doesn’t work for you”. LISTEN. Get them to say No early and often. Be solution focused. Start with “No”. Instead of asking “Do you have a few minutes to talk?”, Ask, “Is now a bad time to talk?”. Either you get “Yes, it’s a bad time.” followed by a good time. Or “No, now is fine”. If you approach a negotiation thinking the other person is like you, you’re projecting. And you’re likely wrong. No deal is better than a bad deal. Deadlines: What is it about a deadline that causes pressure and anxiety? The answer is consequences; the perception of the loss we’ll incur in the future. Deadlines are often arbitrary, almost always flexible, and hardly ever trigger the consequences we think - or are told - they will. You can bend your counterpart’s reality by anchoring his starting point. Before you make an offer, emotionally anchor them by saying how bad it will be. When you get to numbers, set an extreme anchor to make your “real” offer seem reasonable, or use a range to seem less aggressive. The real value of anything depends on what vantage point you’re looking at it from. Queries that the other side can respond to but that have no fixed answers. They buy you time and gives your counterpart the illusion of control. Removes aggression from conversation by acknowledging the other side openly, without resistance. He who learns to disagree without being disagreeable has learned the most valuable secret of negotiation. Calibrated questions avoid verbs or words like, “can”, “is”, “are”, “do”, or “does”. They start with words like “what” “how” and sometimes “why”. What about this is important to you? How can I help make this better for us? How would you like me to proceed? What is it that brought us into this situation? What caused you to do that? If you can’t control your emotions, how can you expect to influence the emotions of another party? When you are verbally assaulted, do not counter. How does this affect the rest of your team? How on board are the people not on this call? What do your colleagues see as their main challenges in this area? What is the biggest challenge you face? How does making a deal with us affect things? What does doing nothing cost you? “Yes” is nothing without “How”. While an agreement is nice, a contract is better, and a signed check is best. Negotiation is often referred to as “the art of letting someone else have your way”. Poor implementation is the cancer that eats your profits. When someone says, “I’ll try”, it really means, “I plan to fail”. 7-38-55: 7% of a message is based on the words, 38% comes from the tone of voice, 55% from the speaker’s body language and face. Rule of 3: Get the other guy to agree 3 times in the same conversation. Pinocchio Effect: Liars use more words than truth tellers. Liars speak in complex sentences. Your offer is generous, I’m sorry, but it just doesn’t work for me. I’m sorry but I’m afraid I just can’t do that. Any response to your offer that is not an outright rejection means you have the edge. Analyst: Methodical & Diligent. Their self-image is linked to minimizing mistakes. Their motto: as much time as it takes to get it right. Analysts hate surprises. They are hypersensitive to reciprocity. It’s vital to be prepared against an analyst. Use clear data to drive your reason; don’t ad-lib, use data to disagree on facts; warn them of issues early; avoid surprises. Accommodator: Mostly likely to build great rapport without actually accomplishing anything. Tend to be sociable, optimistic, distractible, and poor time managers. If they’re your counterpart, be sociable and friendly. Use calibrated questions focused specifically on implementation to nudge them along and find ways to translate their talk into action. Assertive: Their self image is linked to how many things the can get accomplished in a period of time. Assertive wants to be heard. They don’t actually have the ability to listen to you until they know the’ve been heard. They tell rather than ask. When you’re dealing with Assertive types, it’s best to focus on what they have to say, because once they are convinced you understand them, then and only then will they listen for your point of view. Each of these types view the importance of time differently. Thoughts on what you can do when a negotiation seems to be going nowhere. Unless you say, “I feel ____ when you ___ because ____. Remember, no deal is better than a bad deal. Use lots of empathy and different ways of saying “no” to get the other side to counter before you increase your offer. When calculating the final amount, use precise, non round numbers like 37,984, rather than 38,000. On your final number, throw in a non monetary item (that they probably don’t want) to show you’re at your limit. Hidden and unexpected pieces of information (unknown unknowns) whose unearthing has game-changing effects on a negotiation dynamic. Black Swan Theory tells us that things happen that were previously thought to be impossible - or never thought of at all. This is not the same as saying that sometimes things happen against one-in-a-million odds, but rather that things never imagined to come to pass. Black Swans are events or pieces of knowledge that sit outside our regular expectations and therefore cannot be predicted. Always retain a beginners mind. You don’t know what you don’t know. Never overvalue our experience or undervalue the informational and emotional realities served up moment after moment in whatever situation we face. Don’t look to verify what you expect. Positive: your ability as a negotiator to provide - or withhold - things that your counterpart wants. Negative: a negotiator’s ability to make his counterpart suffer. Potential losses loom larger than potential gains. Normative: using the other party’s norms and standards to advance your position. Try to show inconsistencies between your counterparts beliefs and their actions. Paradox of Power - the harder you push, the more likely you are to be met with resistance. Similarity Principle - we trust people more when we view them as being similar or familiar. Research show people respond favorably to requests made in a reasonable tone of voice and followed with a “because” reason. Your counterpart will often reject offers for reasons that have nothing to do with their merits. People operating with incomplete information appear crazy to those who have different information. Discover what your counterpart does not know and supply that information. Copyright text 2018 by Sun Shak.